Automatic Deduction and Disbursement – Bill Pay withdraws the payment from your account and delivers it to your payee. Pay Who You Want – You can set up payments to businesses and individuals. Select Future Payment Dates – Bill Pay gives you the ability to choose when the payment is withdrawn from your account and sent out. You can enter the dates each time or set up recurring payments. Paperless – A great paperless way to keep track of your payments. You can view payment history and prescheduled payments with the click of your mouse. 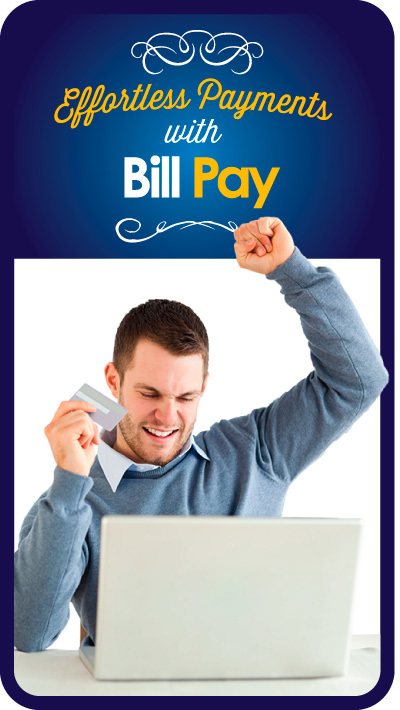 You must be enrolled in Online Banking to activate and use Bill Pay.